As I mentioned in a post last month, I recently upgraded my Windows dictation setup to Dragon NaturallySpeaking (DNS) 12 and Word 2013. This upgrade broke the Emacs dictation interface (vr-mode) I had earlier used with DNS 8 and 10. 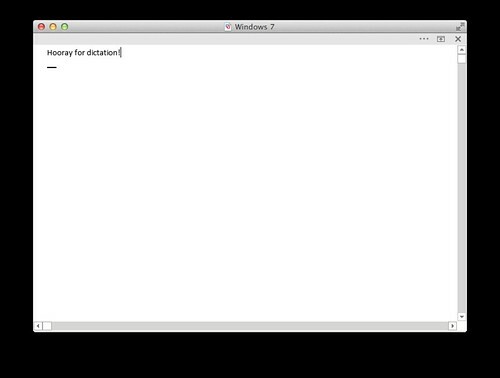 But it also encouraged me to explore new dictation workflows using Natlink directly from my own Python scripts. Primarily, I have since switched from editing entire documents in Windows, or using the clipboard to transfer text, to using my minimal dictation surface as a buffer while editing documents on the Mac side. I was inspired to do this after I spent a day with a radiologist observing PowerScribe 360 in use. There are some disadvantages with this system. If you do want to dictate individual words or something smaller than a sentence into the buffer, you will need to manage the spaces, capitalization and punctuation yourself, since your Word document in the dictation buffer isn’t aware of the surrounding contents. In reality, I seldom find this a problem; saying “no caps” or “lowercase that” from time to time isn’t overly arduous. I could theoretically go even further and implement the Mac side of the solution with an input method rather than services and scripts, which would give me access to the surrounding context, but I think that would be a lot of work for relatively little added benefit. While my setup isn’t yet to the point of being usable “out of the box”, I hope that this brief exploration will help other technically inclined dictation users expand their workflows. As you may have noted if you follow me on Twitter or Flickr, I’ve recently been trying to preserve my and my family’s Apple II life from binders and boxes full of 5.25ʺ and 3.5ʺ disks. There’s a remarkably rich ecosystem of Apple II emulation and file transfer software for the Mac. This and the next few posts, while by no means comprehensive, will discuss the hardware and software which are helping me to save this data. If you still have an Apple II legacy to save, hopefully they’ll help you as well. I use a CFFA3000 in an Apple //e (my first computer). The CFFA software images a floppy (DOS, ProDOS, Apple Pascal, etc.) from a Disk II drive to a file on a CF card in a few seconds. It logs and aggressively retries on read errors. Unfortunately, Disk Copy gives up quickly on read errors, but Mac OS 9 will mount ProDOS disks directly in the Finder, so I have been able to rescue a few individual files when the disk can’t be imaged as a whole. My original expansion bay floppy drive stopped reading reliably after 10–15 disks. I could probably have cleaned it, but either the floppy drive mechanism (the same Mitsubishi one was used in PowerBook SuperDrives from 1994–1998) or complete floppy expansion bay modules are currently available on eBay for $10–15. I bought one of each; one appears to have been damaged in shipment, and I could always scavenge the mechanism out of my PowerBook 540 if I was desperate. If you used 1.4 MB MFM disks on your Apple II, I imagine you may be able to get away with an external USB floppy drive, but I don’t have any such disks to test with. Pester 1.1 has been a long time coming. It’s been my own personal battle with the second-system effect. 1.1b8 is a big step towards finishing, though. Customizable alert sounds—the most requested feature. 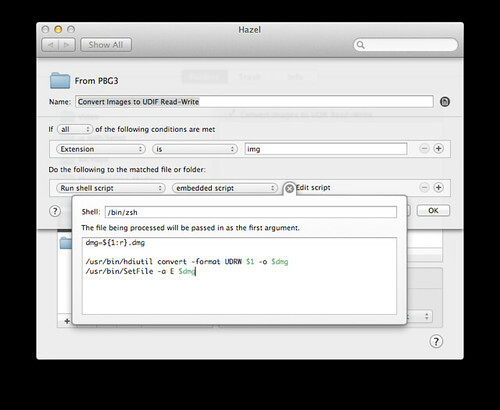 It uses QuickTime, so you’re welcome to pick a movie or even a bitmap or PDF to use as well. I’ve used the latter to display stretching exercises on a regular basis, for example. Baseline, ICU-based support for non-natural language dates and times is much more robust (for example, simply “20” or “8p” works to specify 8:00 PM). Support natural-language dates in non-English languages via Date::Manip. I uncovered some bugs here, which the author of Date::Manip is working on fixing, but Catalan, Danish, Dutch, French, German, Polish and Russian should work fine. The date popup is limited to the days of the week, but that’s easily remedied (see below). Optionally wait until you stop typing or moving the mouse to display a message. This is quite helpful so you don’t start typing into the Snooze box when you want to be typing into another document. The feature is disabled by default; enable it in Preferences. Handle time zone changes, many more time zones, and more reliably determine the time zone. Autocomplete common natural-language dates—my favorite new feature. Simplify tab order. I previously tried to do something very complex with the tab order, which confused Cocoa and could cause you to get “stuck” in some area of the window. Better save and restore focus when you’re working as an alarm goes off; will no longer bring unwanted windows to the front. Open the Set Alarm window in the current Space when triggered with a keyboard equivalent or the Dock menu. Switch to tomorrow automatically if necessary when tabbing into “on”. This is a feature I first implemented in Pester for hiptop, which I’m actually happier with than desktop Pester (see the aforementioned second-system effect). The upshot of this is that if you specify a time that’s already passed, while the specified date is today, simply tabbing into the date field will switch the date to tomorrow. It’s easier to use than to describe, really! Allow intervals up to 999 weeks. Display “today” and “tomorrow” in the bottom left corner of the Set Alarm window in case you can’t remember what day it is. Note that the natural language date’s language is determined by the date format, as specified in System Preferences → Language & Text → Formats. Feel free to put the results in a comment or email them to me (pester at sabi.net). If you’ve got any bug reports, comments or feature requests, please let me know. If you’re looking for things to test, read the release notes in the Read Me (Help menu) which summarize the changes since 1.0. For now, the main thing that needs finishing for 1.1 is documentation (help wanted!). The latest source is on GitHub.